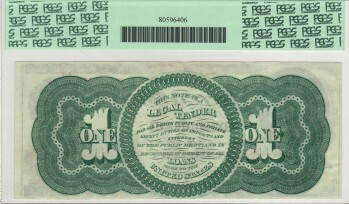 A gorgeous example of this early Legal Ace that possesses fresh and bright paper, bold ink colors, and embossing of the Treasury Seal and serial numbers. 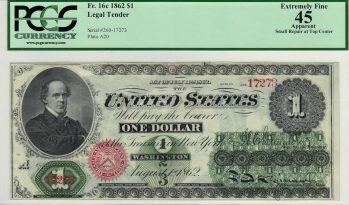 PCGS mentions a small repair in the top margin as the reason for its Apparent designation but the repair is small and insignificant and does nothing to detract from this pretty note's overall appearance. Despite the repair, it is an ideal candidate for a high grade circulated type set.